I’m starting with number 10 of my top furniture makeovers and working up to the number one spot. Kind of sounds like one of those talent shows where the suspense builds doesn’t it. Maybe you can already guess what the number one project is or maybe you’re new here and will be inspired to come back! This is the piece most bloggers know me by. I paint furniture to sell but the radio cabinet is mine. After painting it I just couldn’t let it go. I have to admit to patting myself on the back for this one. This was my first ever Miss Mustard Seed’s Milk Paint project and it is a doozy. The cabinet sits in our den and sometimes the doors are open and sometimes they are closed. Depends on how well the quilts are stacked. You can see the complete tutorial by clicking here …tricycle red radio cabinet. Number 9. 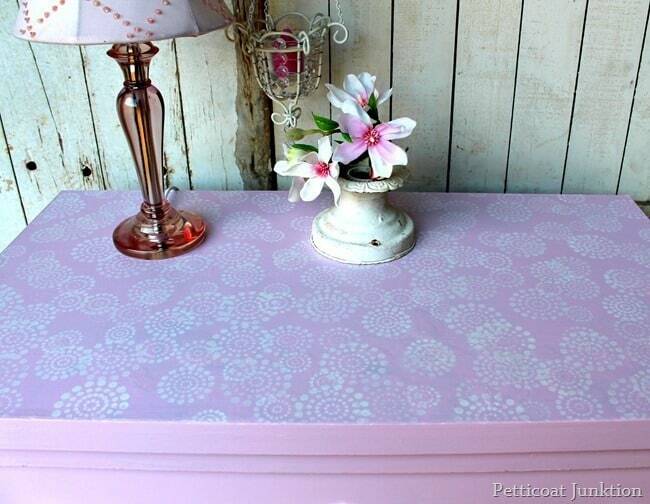 Chest of drawers made of MDF. This little chest of drawers was so sad. The top of the chest was all bubbled up. After taking care of that problem I stenciled a pretty design on the top. You would never know the top was a mess. You can see the project here….damaged mdf. Number 8. Prepping furniture to paint. I take you through the process of getting one piece of furniture ready to paint. Prepping the furniture is the most important part of the makeover and usually the most time consuming. The prep work isn’t hard to do just time consuming. See it here….prepping furniture for paint. I don’t do many knock off projects but I found a piece from Pottery Barn that was calling my name. Of course it was heavily distressed, my fav. But it was a different kind of distressed. You can see the project here…Pottery Barn Knock-Off. This project is from 2012 but continues to be one of my top posts. I guess the project is a favorite because metallic décor is very popular right now. 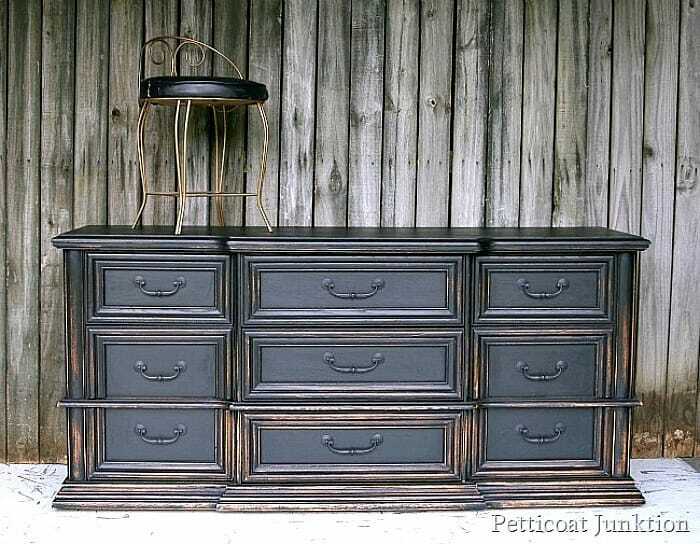 I painted the night stands with Martha Stewart Metallic Paints then aged the paint with toner. The Martha Stewart paint isn’t available anymore but I highly recommend Modern Masters Metallics. You can see the technique here….Aged Metallic Paint. If you love layered paint you came to the right place. I used Vaseline to layer the paint on the sewing machine cabinet. Turquoise and green are such a great color combo. See the technique here….layering paint with Vaseline. The silver paint on this piece is aged with Caromal Colours Toner. The toner is sooooo simple to use and really gives an antique or aged look to the paint. 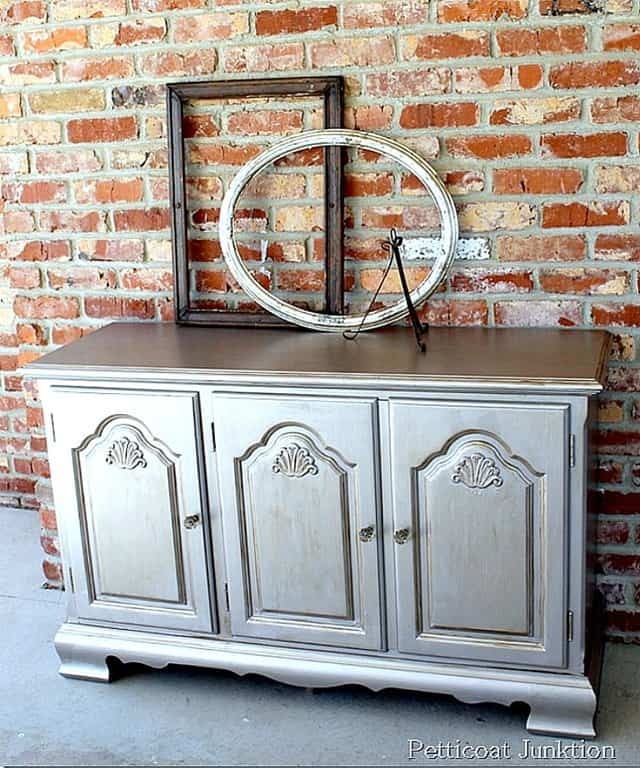 Yep, metallic paint is trending. I painted several pieces silver but am loving the gold metallics. May have to try another metallic project. You can see the complete tutorial for the project here….metallic silver sideboard. This post contains a few tips and tricks I’ve learned in my furniture painting journey. 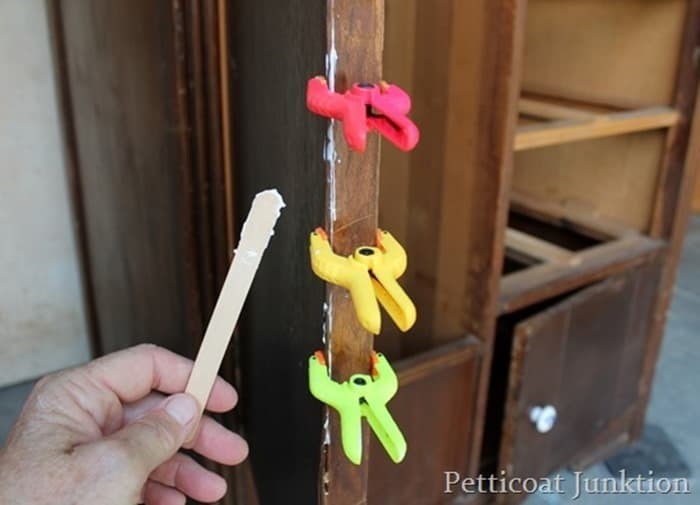 It also includes the paint tutorial for the dresser. 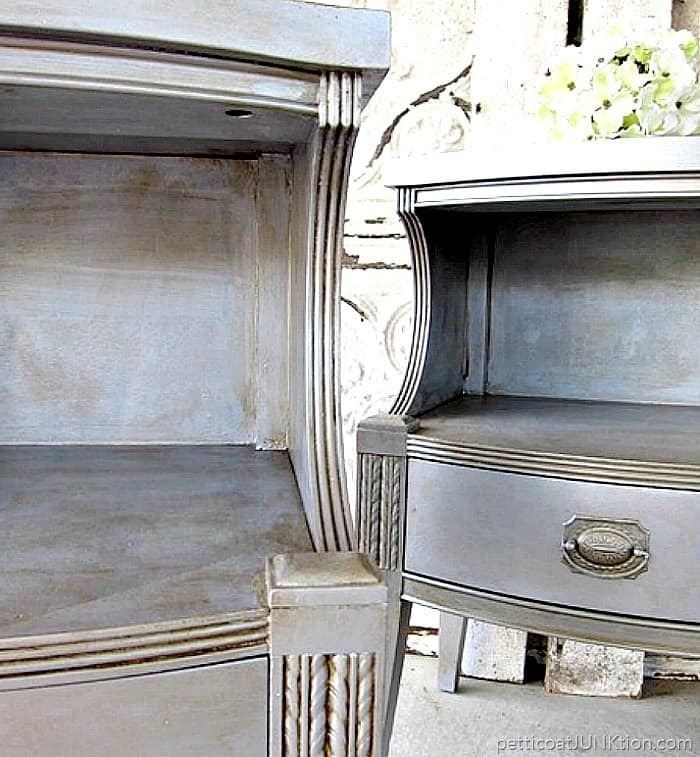 The two tone look and a bit of distressing turned this piece into a real beauty. 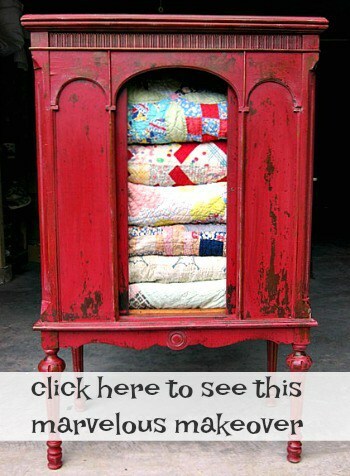 See it here….vintage dresser. 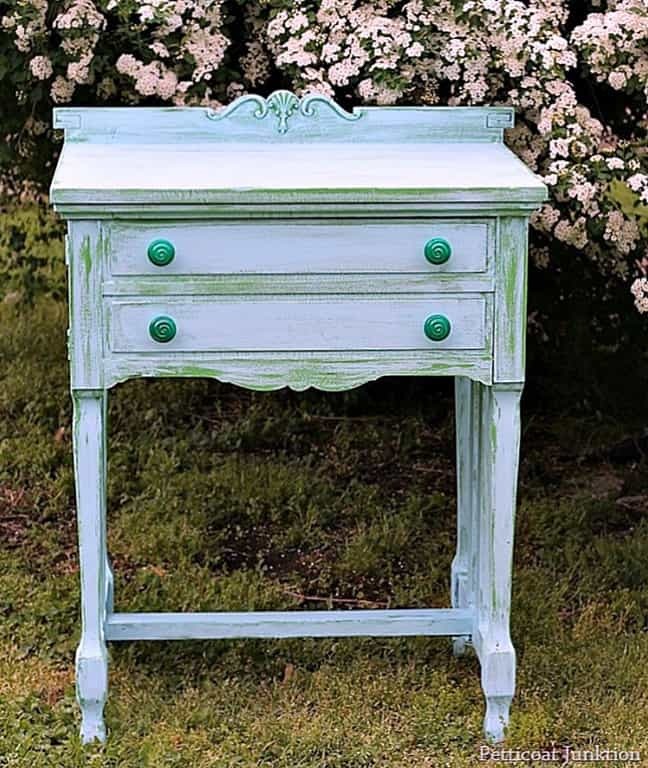 The paint is Miss Mustard Seed’s Milk Paint and the color is Eulalie’s Sky. Such a pretty color. I aged or antiqued the paint using Caromal Colours Toner. The technique is really easy. 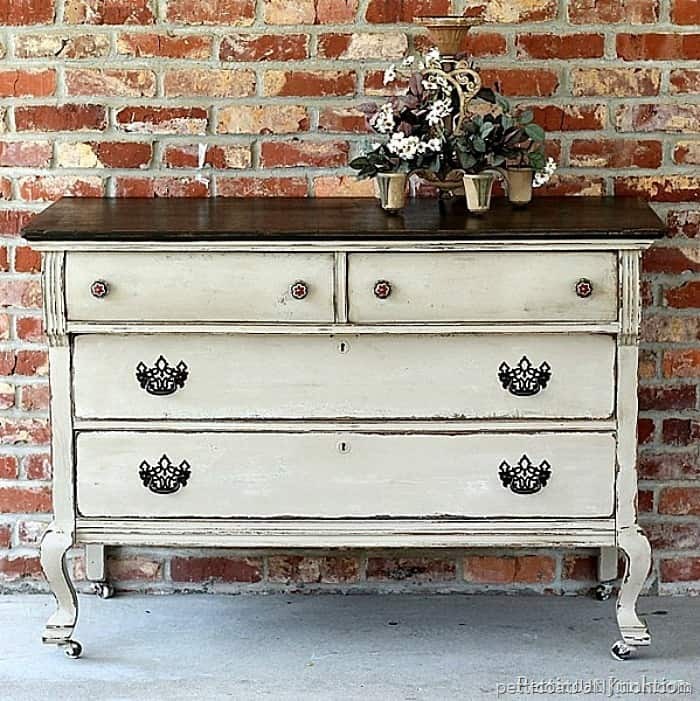 See it here….how to antique furniture. The tutorial on using Vaseline to distress the cedar chest has been my number one post for the past 3 years. The tutorial is really in depth. The only thing I would change about the post if I could is the photography. The photos are horrible. I took them inside with poor lighting and a small point and shoot camera. I guess the photos are good enough. The layer of paint under the red is turquoise and it’s hard to see that from the photos. 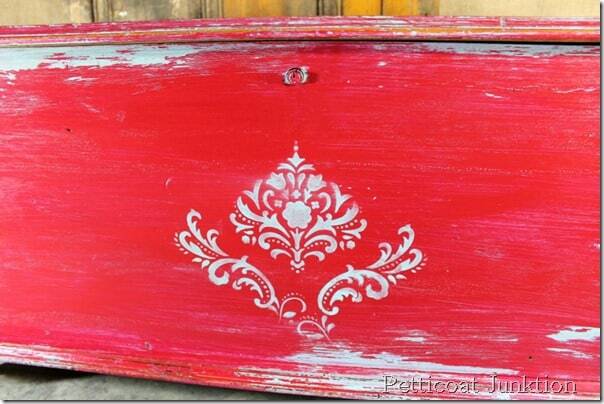 The complete tutorial is here….Cherry Red Chest. Do you have a favorite from the top ten? I’m off to take the Top Ten Post Tour. 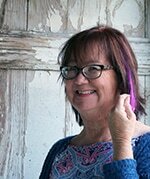 Please join me by clicking the pink links below. I think it’s time to pass that famous red cabinet on to me 🙂 You are so creative, love all your makeovers!! Kathy, you have had such a colorful year! I love love love your cherry red chest the most, but it’s all gorgeous! Wishing you a happy, healthy 2017! 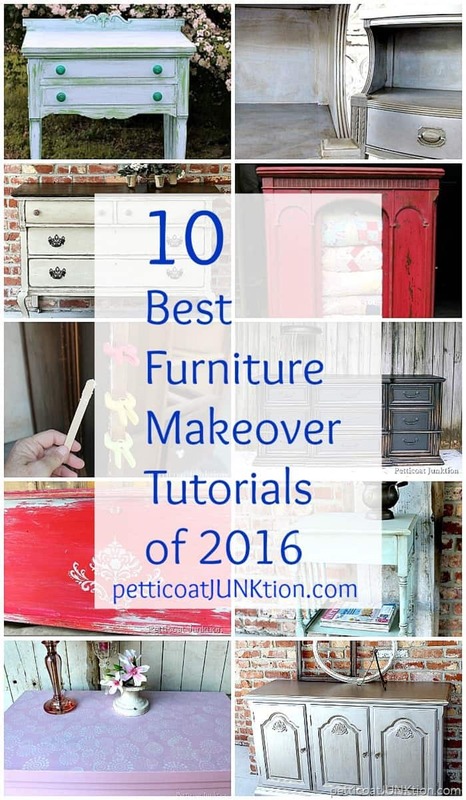 So many gorgeous furniture makeovers Kathy! I have always loved that red cabinet! Great choices, Kathy. Love the metallic paints! I think I’m going to give them a try with some of my projects this year. Have a happy 2017 Kathy! 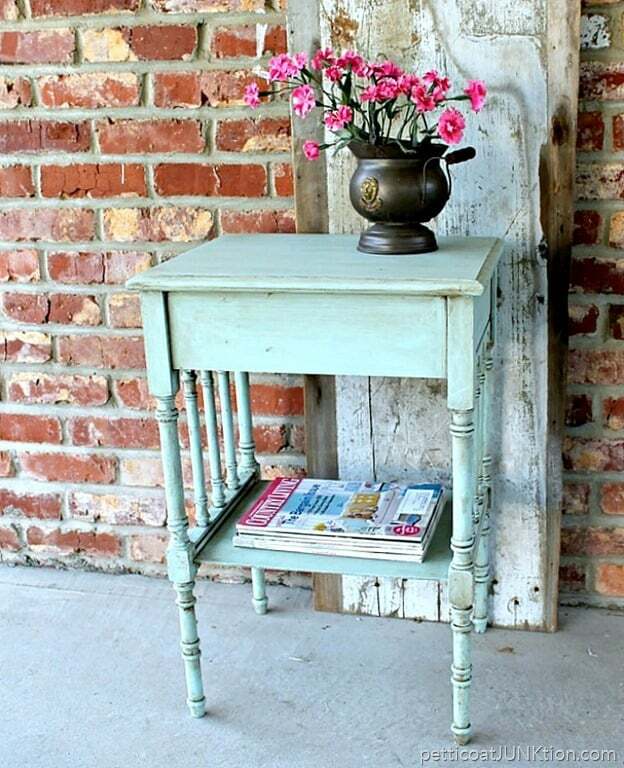 You do such a good job of giving old furniture new life. I look forward to what you share in 2017! Beautiful projects and super tips and tutorials! I love your furniture pieces! My favorite is your #10. 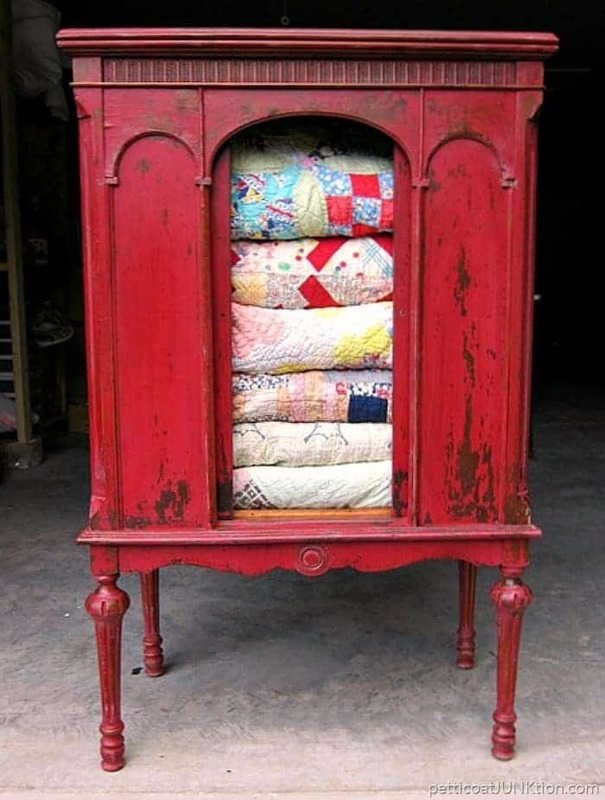 It is such a striking piece, and the quilts stacked inside make it even more special. Best wishes to you and Mr. JTS in the new year!